Actress Gal Gadot’s version of Diana finally arrives from Mezco. 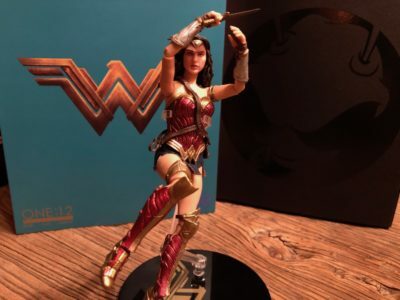 Yes, it’s a “movie figure”, but it’s also a great all-around Wonder Woman. There are not a whole lot of female figures in the One:12 Collective line right now. There’s a Suicide Squad Harley Quinn, and a comic book Catwoman and Ragnarok Hela who are on the way. 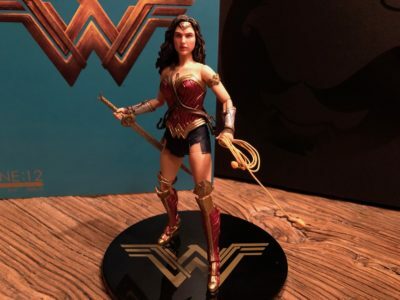 That’s not going to stay that way, since Mezco has been asking fans what female heroes and villains they want to see, but right now it’s pretty limited. So it’s a bright spot for collectors then to see that maybe the greatest female hero of all time, Wonder Woman, has finally arrived. The Amazing Amazon isn’t a comic book edition, which might disappoint some. Still, this Gal Gadot-styled edition is pretty great, and kind of fits in no matter which direction your collection skews. As you’ll see, the sculpt is great, and there are plenty of cool accessories too. So let’s have a look! The packaging here is typical of the One:12 at this point, meaning that it lacks the five-panel box that older releases sported. 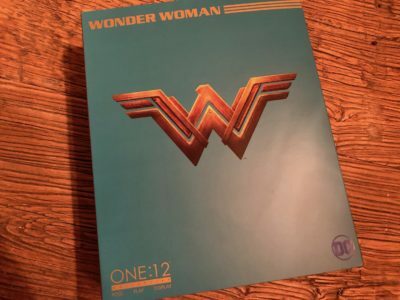 The cover of the box is also somewhat lackluster, with just the Wonder Woman movie logo splashed across it. As someone who uses the One:12 boxes as a backdrop to his collection, I’m not thrilled with some of the choices as of late. Gal Gadot probably wasn’t who a lot of fans imagined taking the role of Diana. But even though that might have been, she has done a great job portraying her in the DC films to date, and has Wonder Woman 1984, which is filming right now. At this point, I doubt there’s a lot of question out there as to her capability as to the part. 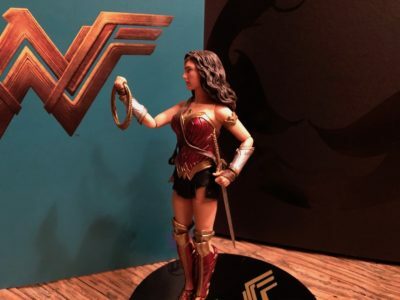 Being that this figure is pattern after the standalone WW film, it bears the actress’ likeness. And it’s actually a really good sculpt. Diana actually looks like Gadot, and includes two face sculpts, in slightly altered expressions. Both look great, though I do have to add that the faces aren’t all that different. It would have been cool to get maybe a rage-filled WW as well. In terms of accessories though, I can’t imagine a better selection for WW. 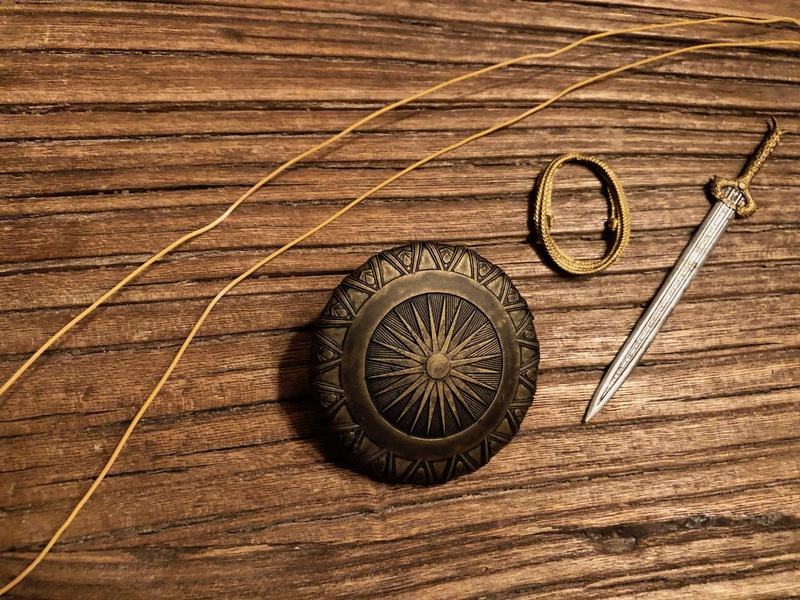 Included here is the God-killer sword, Themysciran shield, and two versions of the Lasso of Truth. You get one that’s coiled up for hanging off of Wonder Woman’s belt, and another that’s bendy for action poses. I don’t really care for the ends of the bendy one, since they’re oddly huge, but I guess there wasn’t much of a way around this. It has to be chunky enough for her to actually hold onto after all. Since this is a One:12 figure, there’s also an assortment of hands included. You get a pairs of open, fisted, and grasping hands in the box. All are well detailed, though they were a lot more gummy than I’m used to with this line. I don’t think there’ll be a problem hanging onto accessories while standing on the shelf, but over time there might be. 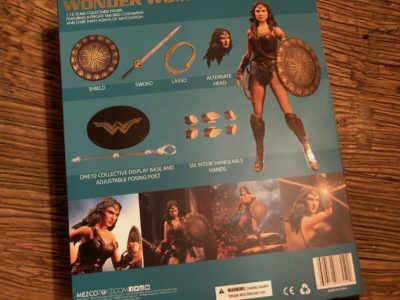 While I had some issues with the above, the outfit that Wonder Woman was put in here is top notch. She’s decked out in a near-perfect mimic for the movie suit as far as I can tell. And really, that costume is pretty much right there with the comic book outfit in the modern book, so it almost has the look of just a really good, general Wondy suit. The skirt is fabric, while everything else is hard plastic. All of the sculpting looks phenomenal on it too, with awesome detailing on the boots, bracers, and the main body of the suit. About that though, don’t try to put her in too many dynamic poses. Again, everything except the skirt is cast in hard plastic, and that means that there’s no ab crunch at all. It does limit posing a bit, especially if you were thinking of displaying her in a flying pose. 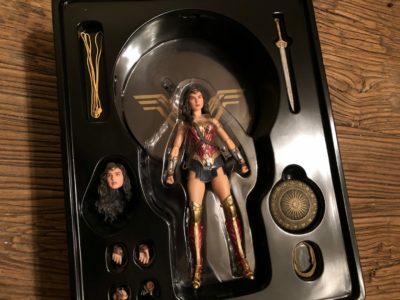 Of course, the usual “arm” is also included in the box for that kind of display, along with a Wonder Woman-branded peg stand. Other than that though, the articulation is as good as any other One:12 figure. Ball joints at the hips and shoulders along with elbow and knee joints allow for a solid range of movement. Wonder Woman’s flowing locks do kind of hinder neck movement, but you can get some good poses out of her anyway. 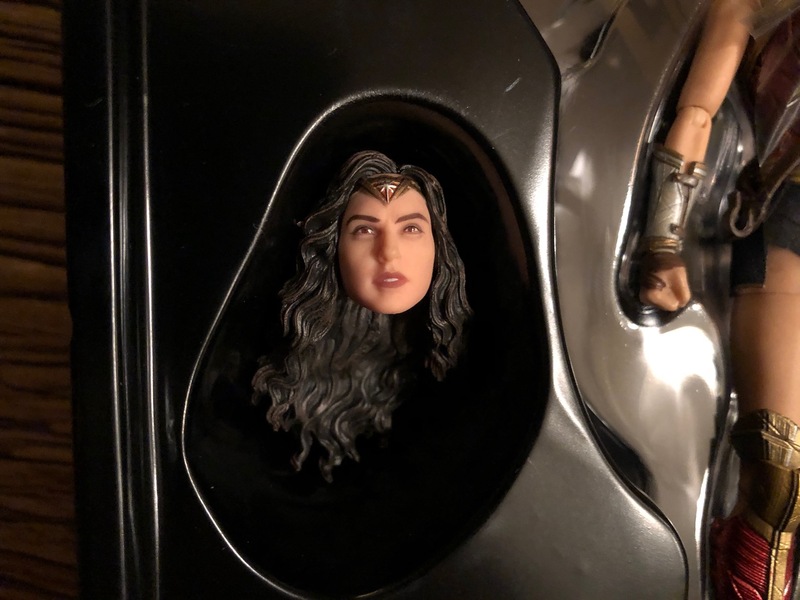 The bottom line is that there are some serious drawbacks to Mezco’s first Wonder Woman. Among the minor issues I had with it, the portrait options aren’t great, and there’s no possible movement to the mid-section. Those are semi-big deals, that I feel should have been addressed. And yet, they’re still not deal breakers for me. 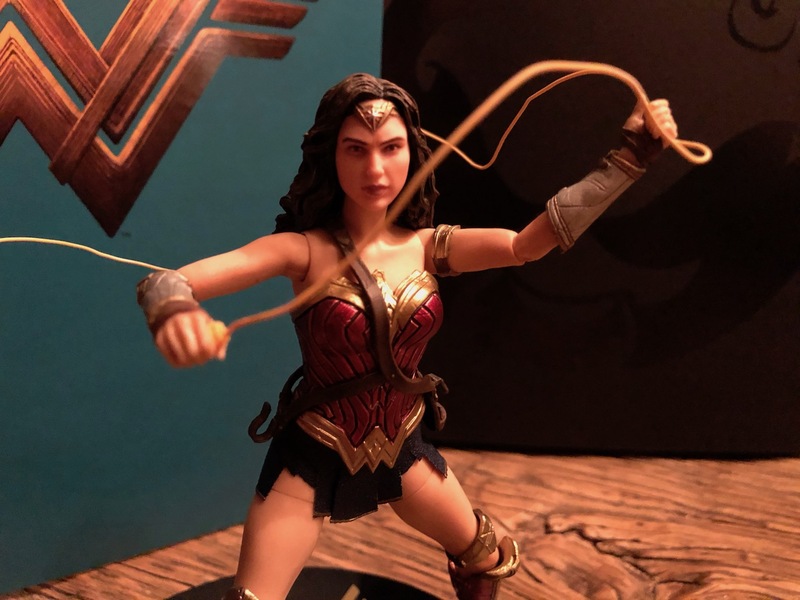 Overall, this is a great Wonder Woman figure that uses the movie costume and Gal Gadot likeness to great effect. And as a bonus, it also looks great next to Mezco’s comic book-based figures (especially if you remove the sword/lasso bandolier). 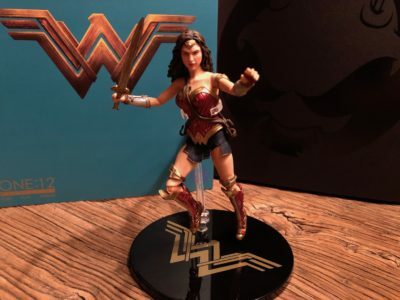 I'm a little torn about the first Wonder Woman figure in the One:12 Collective. I like the accessories, and the detailing on the suit as well as the sculpting on the faces included. The articulation though, is not great thanks to no ab crunch, and there are some minor issues here and there. In the end, and even though I'm happy overall, this is a One:12-er that I'd probably best label "good", and that's a rarity.